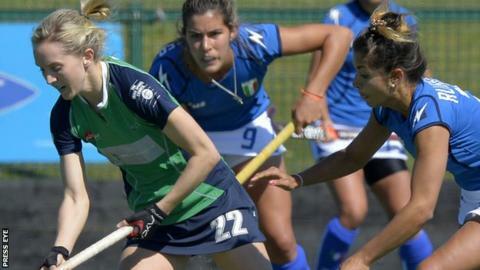 Ireland staged a late revival to earn a draw with Italy after being 3-0 down in Sunday's Test match at the Ulster University, Jordanstown. It was the last of three games between the sides, Ireland having won the opener before a 1-1 draw on Saturday. Looking well beaten going into the final quarter, Ireland scored three goals in 10 minutes through Michelle Harvey, Chloe Brown and Deirdre Duke. Loreto's Nicola Daly made her 100th appearance for Ireland in the match. Italy had taken the lead in the 11th minute through Macarena Ronsisvalli with Valentina Braconi and Giuliana Ruggieri adding to their tally.